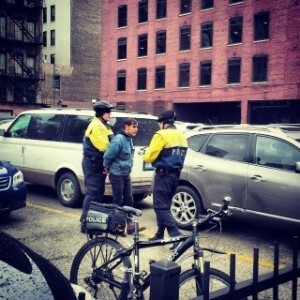 The arrest of Jose “Zé” Garcia, May Day 2014. In tandem with this minor scandal, the US labor world is anticipating a series of demonstrations to be held on May 15th, the largest to date for the $15/hr minimum wage movement in the fast food industry, variously titled Fast Food Forward (FFF), and Fight For $15. Accompanying this story on high profile reformist outlets such as Salon is the following dramatic stock photo, credited to the AP, which has appeared more than a few times attached in FFF stories, with little context. Compelling human drama, completely out of context. I was present when this photo was taken. And I snapped some photos of my own. While the recent Salon piece simply captions the photo “Demonstrators supporting fast food workers protest outside a McDonald’s”, the real story is much more interesting and helps put the events of May Day 2014 in context. The demonstration from this photograph was held July 29th, 2013, in New York’s Union Square, the radical history of which, populated by the likes of Emma Goldman, is exploited regularly by reformist campaigns of every stripe. The SEIU had called a citywide “strike” of fast food workers, which only drew individual strikers from shops all over the city. This strategy seemed even less what Nate Hawthorne dubbed “venture syndicalism” and more what has Adam Weaver called “a march on the media”, meaning the latter took precedent over the former, although both analyses are mostly correct. The SEIU marshals policed the demonstration tightly, directing the marchers where to stand, sometimes telling them what to say, or else warning them not to talk to anyone. 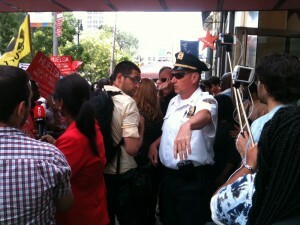 After a carefully orchestrated media spectacle in Union Square, a two block “march” ensued, ending at a McDonalds, where a number of Democratic politicians were prepared to give speeches to the assembled cameras. The workers attracted to FFF are the most militant, resourceful, proactive, and perhaps desperate of their shops. The initiative and courage of these workers is drawn upon by the SEIU, which then attempts to manage it within tight parameters toward campaign one part public relations and one part negotiating behind the scenes with management, masquerading as a worker-driven union drive. Workers who struggle in isolation by themselves each day are given the chance to be a part of something bigger, and their instincts are correct in choosing to be. But the SEIU is a dead end. 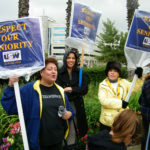 In order to win collective bargaining representation at private nursing homes, the SEIU blocked with their managements in Florida, Texas and particularly California against indigent patients’ rights, getting the California legislature to pass a bill which gave the nursing homes $3 billion over 5 years, guaranteed company profits, and gutted patients’ rights. The SEIU then joined with the nursing homes to crush the Nursing Home Residents Bill of Rights, much to the consternation of activists attempting to curb elder abuse in such homes. The SEIU claimed this was to help workers and improve patient care. In exchange for this help, the nursing homes agreed not to block SEIU organizing. [Then SEIU President Andy] Stern and SEIU also formed an alliance with California health care giant Kaiser Permanente, and in the state of New York, lobbied with employers for legislative funding and a plan to close hospitals. Not only do these back room dealings adversely working class communities (in this case diminished accountability, closed hospitals, gutted patients rights, etc. ), but they disempower the very workers who made the union drive a success by their undemocratic nature. In US Labor in Trouble and Transition, Kim Moody (who is far more optimistic about the potential for reviving radical American unionism than myself) classifies the period of US labor since the 1980s–exemplified by the SEIU, today’s business union par excellence–as defined by the survival strategy of “not to make gains, deal with the problems of the workplace, or grow the union, but to preserve the union as an institution and the leadership’s position in it”. 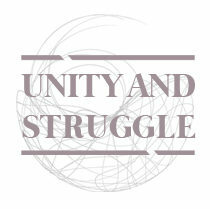 These strategies, though altered a bit as the SEIU seeks to expand into uncharted terrain, are easily observable in the state collaboration and top down management the union has demonstrated thus far in FFF: “[They] did not require militancy, membership support, or an attack on America’s racial divide. They specifically involved abandonment of any fight over workplace power, as concessions and labor-management cooperation ceded long contested authority to management” (108-9). An interesting difference with FFF is that a bit of worker initiative is needed to get the “venture syndicalist” operation off the ground, after which time it must be subdued roughly. Once added to the ranks of the SEIU, new union members go from having one boss to having two, and the union helps the capitalist manage the exploitation of the worker, while allowing the worker to sometimes blow off a little steam. The relationship of worker and boss is of course never challenged, as the union has agreed in advance not to strike, contracts get longer and longer, concessions are made in every bargaining session, and stewards are often indecipherable from management in grievance procedures. Even materially speaking, the union in 2014 can do little for the workers actively except prevent them from taking the kind of radical action necessary to build a society based on human needs, not exploitation. 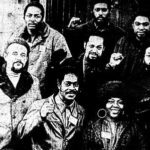 This is a delicate balance which contemporary reformist groups, from immigration rights to alternative labor, routinely navigate when they attempt to harness the political energy of people who capitalism has no future to offer, into reformist efforts which will ultimately frustrate their struggles. Attempting to cynically use people whose needs can only be achieved by revolutionary struggle is a potentially explosive gamble, and the amount of muscle groups like the SEIU hire to manage the crowd demonstrates they are acutely aware of this. And on July 29th, things almost got out of hand. No matter the crushing disempowerment of SEIU tactics, on this day the material conditions facing these workers were heavier; they were angry, and the crowd was fired up. 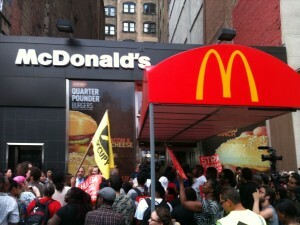 When the march reached the McDonalds, some of the workers attempted to storm inside in an act of escalation. But this wasn’t part of the SEIU plan (though a subsequent demonstration I attended took this additional step, carefully managed by police, SEIU marshals, and private security working in close collaboration, observing a prior agreed upon fifteen minute time restriction). 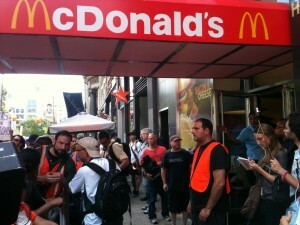 On this day, burly SEIU marshals in neon vests blocked the doors, while other SEIU staffers hastily erected a barrier between the crowd and the hated McDonalds. As part of this campaign’s constant cooperation with the state,”pig pen” police barricades had been set in place off to the side long in advance, but the surging crowd almost caught the union staffers and the cops off guard. 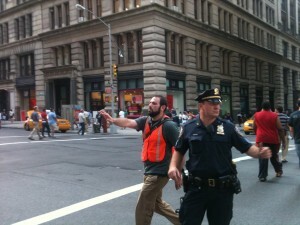 The cops had a visible presence but mostly left the policing to the SEIU 32BJ marshals. Opposite sides of the class line. 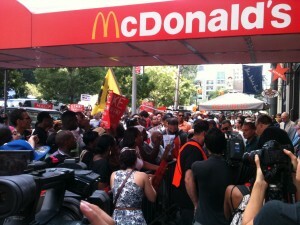 The barrier was quickly installed by the SEIU to protect McDonalds from the angry workers pictured above, and to maintain their control over the demonstration so that the Democratic politicians could speak. The barricade further enraged the workers, who rocked it back and forth, chanting “Shame on you!” at the police, and possibly the SEIU staffers themselves. The instincts of the workers, again correct, were to escalate the situation. The majority people of color fast food workers shouted at the mostly white cops and there was no question whether low wages and police repression were intimately connected in the struggles they faced each day. 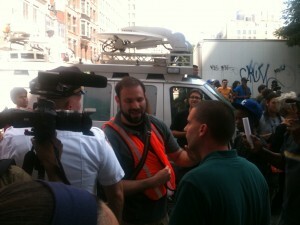 In response, the cops and SEIU marshals teamed up to hold the barricade in place against the workers. The workers screamed back. This is when the AP stock photo was snapped. 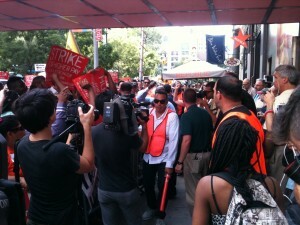 The workers on one side of the barricade, the police and SEIU on the other. The SEIU marshal and the “white shirt” NYPD officer who both seemed to be in charge of their respective camps held a side conference. The energy was soon sapped from the demonstration as the cajoling of the staffers (good cop) and the threat of arrest from the police (bad cop) cooled the crowd down. The Democratic politicians were able to give their campaign speeches, and one of the same marshals who had restrained the workers announced a march to SEIU 32BJ’s multimillion dollar headquarters down the street, where the workers would be treated to more speeches. 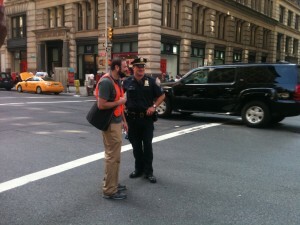 Along the way, this marshal and others policed the march alongside the NYPD, making sure nobody jaywalked. Nobody was arrested on July 29th, but if someone had been deemed out of line by the SEIU marshals, there is little question that what happened in Chicago would have happened in NYC. Chicago’s May Day 2014 was no aberration. This is how the SEIU operates. The actions of their marshals and those of the police are virtually indistinguishable, as a matter of practice. 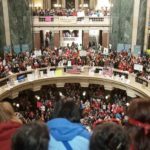 And this is not just how they roll at demonstrations, it is the structural role the SEIU and all business unions play–policing workers struggles and making sure they don’t challenge capitalism. Jocelyn Cohn and I developed this position more systematically last year in “Our Friends with Benefits On The Union Question“, and its analysis is only confirmed by the rise of “alt labor” (alternative in name only). In an economic crisis such as ours the reformists will talk and sometimes walk to the left, using radical language, engaging in symbolic “direction actions” (like the symbolic and stage-managed arrest of union brass during Occupy, achieved through the hijacking and disempowerment of the larger struggle), and generally seeking to harness the radical energy that a crisis moment produces. Projects like FFF represent the SEIU’s attempt to experiment on the boundaries of their own failing union, and embattled Democratic Party fronts like New York Communities for Change. (In different cities the different nonprofits vary, and it seems that outside of NYC more autonomous actors have found themselves in coalition with the SEIU, but the participation of the juggernaut union remains an internal limitation.) This allows both parties to dodge for a time legal and tax regulations bearing on union organizing and political campaigning, respectively, while simultaneously exploring new ground from which their moribund political forms can sap the energy of well-meaning working class people toward the interest of capital. It is important to note that there seems to be little coherent plan at play in “alt labor”, and FFF and other projects remain very much experiments, the form of which remains to be determined by practical actions in the coming months and years. However optimistic this may sound, the presence of SEIU and other reformist groups represents and internal limitation of these projects which cannot be overcome except by a left-wing split which leaves these groups in the dust. Otherwise, well-meaning activists will simply be doing the work of expanding the scope and the recuperative potential of unions and political parties representing the interests of the bourgeoisie in active antagonism with the proletariat. And an alternative labor movement lead by or comprised of business unions like the SEIU can only serve a recuperative and counterrevolutionary role in the struggles of tomorrow. The questions which I have heard echoing around left circles about collaboration with the SEIU, or even of revolutionaries working as staffers for such unions, are too focused on the individual/ethical dimension, e.g. a what few well-meaning organizers can do within the union form. This under-emphasizes the structural role that unions play in the reproduction of the class relation, and over-emphasizes the individual subjective factor in changing a reformist bureaucracy “from within” (echoing similar reformist projects to push the Democratic Party or the bourgeois state “to the left”). Again, Jocelyn and I have developed this position systematically in our union piece, and the skeptical would do themselves a service to read it there, as well as HiFi and Mazin’s follow-up. The future for fast food workers, radical workers’ struggles in general, and the larger struggles to which they must give way all depend on working class people deciding once and for all on which side of the barricades unions like the SEIU come down. Previous post: Loot Back: From Whom?